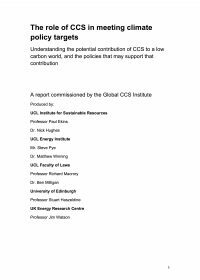 This report outlines the methodology used to capture the history and lessons learnt by the Rotterdam CCS Network Project. to improve delivery of the Rotterdam CCS Network Project by reviewing its own project development processes. a local (political) commitment to a long term approach towards CCS deployment which transcends the region of Rotterdam. The Rotterdam CCS Network project has experience in a large number of fields that are highly relevant to other CCS projects. These include: use of goals and means; internal organisation; co-operation with industry, authorities and other stakeholders; technical, financial, legal and communication aspects; and lobbying.